This month we acknowledge the military service of the New Zealand troops who fought in and died during the devastating Battle of Passchendaele 100 years ago. However, in this blog, history curator Kirstie Ross considers other notions of duty and service that many men, like Levin farmer Leslie Adkin, had to weigh up in the face of the demands being made on them to serve as soldiers. When war broke out in August 1914, Horowhenua farmer Leslie Adkin was a prime candidate for the army. Twenty-six and single, he had proven his worth as a special constable during the 1913 strike, and had a brother who could help run the family farm if Adkin signed up. [The Levin Troop]. From the album Wellington waterfront strike, 1913. Te Papa (O.030460). 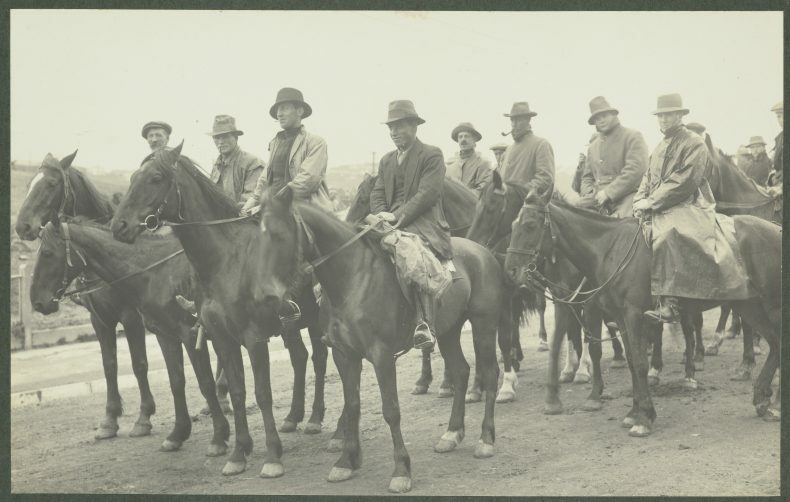 Leslie Adkin is front right on horseback. In fact, Adkin quickly joined the local mounted reserve that formed and drilled during the first few days of the war, and quickly decided, as he put it in his diary, that ‘the Kaiser is quite insane and as a result thousands are going to their death’. Adkin kept diaries and photographed his daily life through the war years, and for most of his life, and religiously reported war news for the first year of the conflict. And from this photograph he took, we can also see that he enjoyed public displays of imperial hubris. 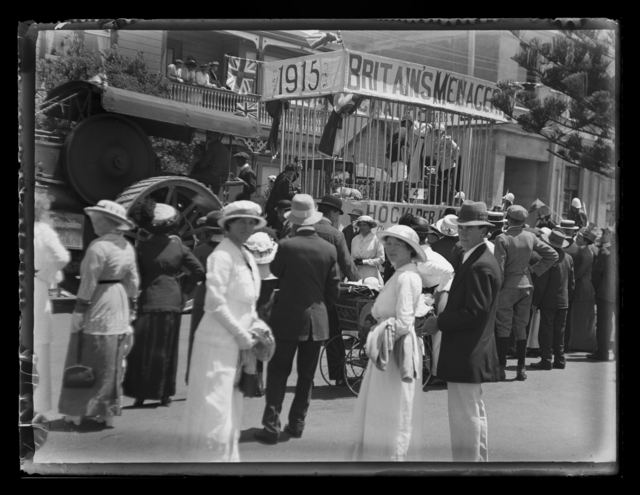 This float, which appeared in a street a parade in Napier, boldly predicted that in 1915 the enemies of the British Empire would be captured and caged like beasts in a menagerie. This observation, which was followed by a list of local boys wounded on Gallipoli, hints that local and public expectations were prodding Adkin’s sense of duty. While Adkin obliquely hinted that he might appeal his conscription when this occurred (in September 1917) these are the only places in his diary where he touched on the issue of his non-enlistment. So what can we do with black looks and silence? Bart Ziino’s recent article ‘Eligible men: men families and masculine duty in Great War Australia’ provides a useful touchstone for this dilemma. During the First World War, men had to weigh up doing their military duty for the Empire against fulfilling economic and family obligations. Ziino’s article considers how the ‘demands of martial manhood collided with the priorities of a male breadwinner’, especially if the latter prevailed and a man stayed at home, which meant he risked being labelled unpatriotic and a ‘shirker’. This was the situation that Adkin found himself to be in when war was declared. Adkin was keenly aware of his masculine duty as a future husband and breadwinner: he had for some time been courting Maud Herd (see above), but had deferred his engagement because of his poor economic situation. Ignoring this protest, the couple married in December 1915 and set to work establishing a home together. This served as a tangible statement through which Adkin publicly asserted his primary duty: his commitment to being a loving and responsible husband who would provide for his new wife. 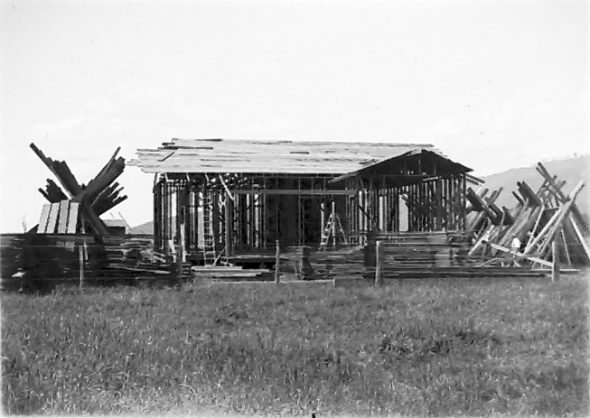 Adkin engaged an architect in July 1915 and the build began in November. 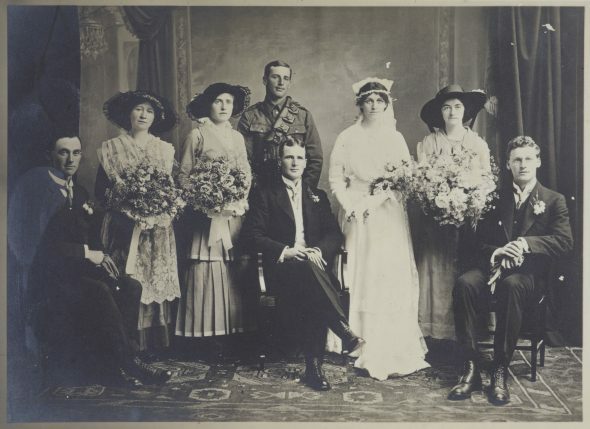 In March 1916, three months after the couple married their new home, ‘Woodside’, was ready. All through its construction, Akdin recorded the selection of construction materials – such as asbestos for the interior lining and rubberoid for the roof – and proudly showed off its progress to friends and family. 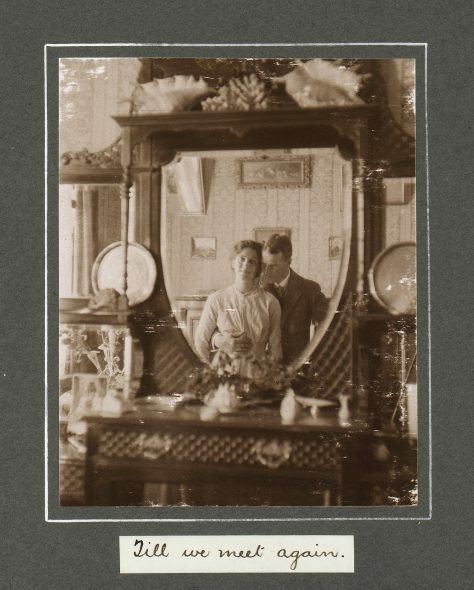 He was also very invested in creating a comfortable home for himself and Maud. 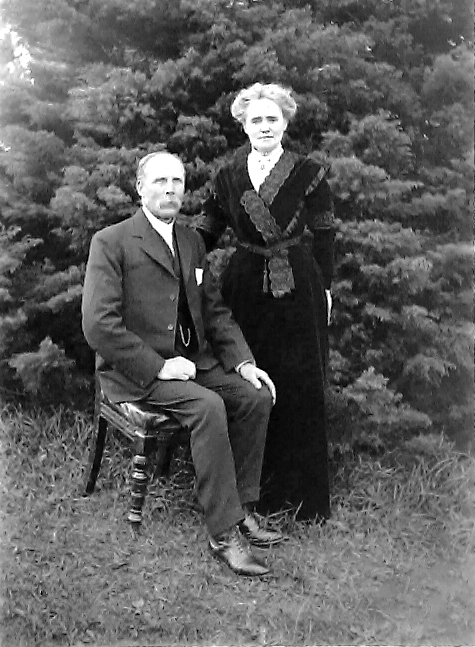 Before their wedding, Adkin shopped for furniture with his mother in Levin, where ‘prices and quality were equal to Wellington firms’; although he and Maud preferred to select their wallpapers, pressed metal ceiling designs; fireplace tiles; and ‘door furniture’ in the capital. 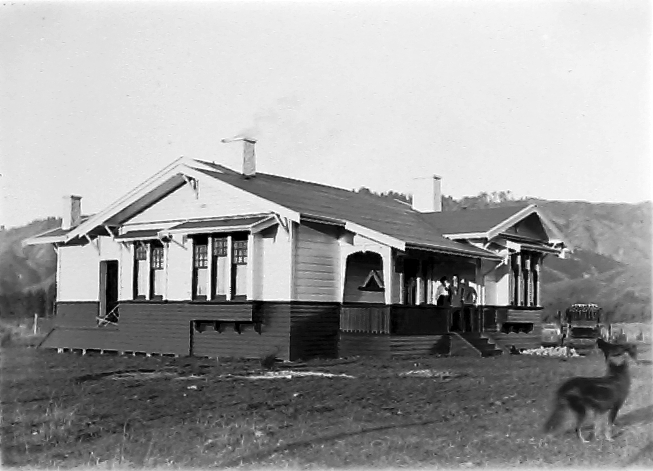 Here is the first photo taken of ‘Woodside’: Leslie and Maud Adkin are standing on the verandah. Adkin’s title for it was ‘The Dream that came True’. This is an apt description of the modest wooden bungalow’s meaning and its power to realise the words Adkin could or would not write. ‘Woodside’ was the culmination and architectural declaration of Adkin’s devotion to Maud. It spoke volumes about where his sense of duty lay. To observers, the house couldn’t help but be seen as a solid but silent foil to unspoken claims that Adkin was ‘shirking’. Anthony Dreaver, An Eye for Country: The Life and Work of Leslie Adkin, VUP, 1997. Bart Ziino, ‘Eligible Men: Men, Families and Masculine Duty in Great War Australia’, History Australia, 14, 2, 2017, pp. 202-17. David Littlewood, ‘The dutifully reluctant: New Zealanders’ appeals for exemption from conscription, 1916-1918’, New Zealand Journal of History, 50, 2, 2016, pp. 26-43.